Do you miss the days of being able to run a simpler operating system such as Windows 95 and to use it to run some popular games like Doom, Wolfensteing 3D, and Grand Prix Circuit? Even better do you want to run it on newer operating systems like Linux, macOS, and Windows 10? Now you can, with the release of Windows 95 being distributed as an Electron application. With the release of Windows95 version 2 this month, Rieseberg added some new features such as the ability to reset a machine and play sound. In addition, the developer added some popular games such as Doom, Wolfenstein 3D, A10 Tank Killer, and Grand Prix Circuit. • Installed Doom, Wolfenstein3D, A10 Tank Killer, and Grand Prix Circuit. In BleepingComputer's tests, the actual operating system ran really well and we did not encounter too many issues other than having synchronization issues with the mouse cursor a few times. 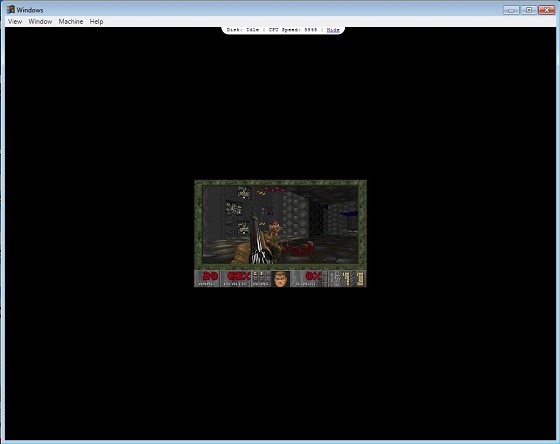 The games still need a bit of work, though, as they were not able to run in a full screen as shown by DOOM below. For those who want to play with Windows 95, get a sense of nostalgia, and play some free games, it is worth giving a try.